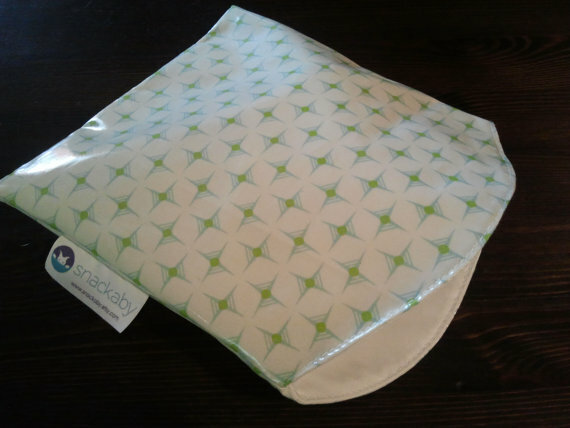 The sweet folks at Snackaby contacted me to see if I would be interested in doing a review of their reusable snack and sandwich bags. School was about to start and my hubby takes his lunch almost daily, so I was excited about the opportunity. This was my first experience with reusable baggies. We usually used reusable containers, but sometimes those just are not practical – like taking sandwiches to the museum, or sending almonds with my husband. I really hate using ziplocks because I feel like I am throwing money away. Snackabies are made by two moms who knew there was a better way than plastic, disposable bags. They wanted something safe, reusable and environmentally friendly. They accomplished just that. I really like these bags. I was afraid that because they were not air-tight that the sandwiches would dry out, but that was not the case. I made a PB&J for my daughter and she only ate half, the other half stayed in the Snackaby bag in the fridge for a few days and the bread was as soft as when I made the sandwich. Love it! The velcro closure is also easy for kids to use. The best feature of these bags is the pull-out tab to clean the inside and outside of the bag at the same time. Genius! The bags can be washed this way in the dishwasher – another genius feature. Of course Snackaby reusable bags are non-toxic – Snackabies are made of laminated cotton on the outside and a food-safe, polyurethane laminate that is free of DEHP, Phthalate and BPA plasticizers, on the inside. Cons – Hmmm, if I HAD to come up with cons I’d say if you wash these by hand don’t submerge in water because they take forever to dry that way. These bags are also not completely air tight, thus not good for anything that may have liquid, like some fruits (i.e. berries, watermelon, pineapple). Cost – $10 for the sandwich bag, $8 for the snack bag or $17 for a set. I probably spend around this a year, so it will be a cost-saver in the long-run. But I have no reservations about recommending these bags. The pull out tab for washing is great and they wipe clean very easily too. Visit them on Facebook and follow them on Twitter. Thank you Snackaby for the opportunity to try these great bags! When the Happy Mama wash first arrived from Earth Mama Angel Baby, I was not sure I liked the smell (but read on… :). I think I was expecting something similar to the baby wash (a vanilla-orange scent – oh so yummy!). The Happy Mama wash is a ginger-grapefruit scent. The next morning I gave it a whirl. Now, I do not know if my sniffer was having a moment when the Happy Mama wash first arrived, or if the hot steam in the shower had anything to do with it, but the scent was awesome!!! I truly felt like I was at a spa. The ginger scent is supposed to be great for those with morning sickness and since the EMAB products are rated zero (0) on the EWG’s database, it’s completely safe during pregnancy and beyond. Good to know because I had horrible morning sickness with both my kids – just in case the Lord blesses us with a third. Being non-toxic is so important as chemicals can be absorbed into your skin. So this wash is safe for the entire family! The Mama Wash is made of essential oils and comes in a foam pump, which I really love. The soap is hydrating, so does not dry out my sensitive skin like some soaps. The packaging is really sweet and the ingredients are spelled out clearly and you can pronounce them, which is a must in my book. The only negative I have is that the suds do not last long, but admit that could more so be because we have hard water. I use a loofa and have to reload with a few pumps of the wash several times during the cleansing process. While my son’s wash has lasted 3-4 months, I don’t think this bottle will last this long, maybe half that. Being on a tight budget, I will probably keep this as a special treat one or twice a week, and use my olive oil soap in between. It smells so wonderful though, I fully expect I will cheat…. No harsh detergents and zero toxins mean that it’s safe enough for pregnant women, so it’s safe enough for the whole family! The Mamas at EMAB are also amazing! They really know their stuff and have an amazing product line. And customer service is top notch. Win some Happy Mama Wash for yourself. OK, here are the rules. Contest is open to US and Canadian Mama’s only. 1. Go to the EMAB website and tell us which product you would love to try (or which is your favorite if you are already a fan). Contest ends at midnight CST on November 14. Or if you don’t want to wait, hop on over to the EMAB website and pick some up for yourself, while there, don’t forget about baby and get the Angel Baby Shampoo and Body Wash, Angel Baby Bottom Balm and Angel Baby Lotion too. The lotion is amazing for eczema – I use it on my son as well. Disclaimer: EMAB sent a bottle of the Happy Mama Wash in exchange for a honest review. All opinions here are my own and in no way is reflected by receiving this product – not how I operate! When we toss out old items, we really do not think about the toxins in old cell phones, styrofoam containers, etc. and the impact they will have on the health of the earth, animals and humans, especially our children. Even when going to a landfill, those toxins leach out into the ground and eventually taint our drinking water, soil and air. The good news is, we can reduce the amount of trash we contribute on a daily basis to help keep this Earth clean and healthy for our children and grandchildren. Going green really is not a big deal and in some ways can make your life easier and can save you money! Here are some very simple things we can all do to go green and reduce waste. 6. Donate old furniture, appliances, cell phones, eye glasses, etc. rather than sending them to the dump. Whole Foods has bins for old glasses, cell phones and plastic bags. 9. Shred paper rather than tossing it and use it for packing material or even composting. Or put it in the recycling bin. 15. Get paid for your recycle-able goods — you can get cash for aluminum cans, glass bottles and other items at many recycling centers. Check with the center to find out details. See #12 about getting paid for electronics. Going green really is not a big deal and in some ways can make your life easier and can save you money! Here are some very simple things we can all do to go green and save energy. 1. Unplug appliances when not in use such as computers, printers, toasters, can openers, even the microwave! Or install a smart power strip that senses when appliances are off. 2. This includes cell phone and toothbrush chargers – don’t leave them plugged in all the time. Charge them during the day so you can unplug when it’s fully charged rather than leaving it plugged in all night. Have your own energy-saving tip? Please add a comment below!